a) Fully Assembled Frame with ready fitted sidelights ready to install. b) Fully Factory finished in a clear lacquer so ready to install on delivery. c) All keeps, lock, drop bolts factory fitted for speed of installation on site. ( Handle and hinges to be fitted on site into premachined locations. d) Delivered to your door in 5 working days - subject to stock availability. e) 58mm thick, solid laminated oak doors ( for stability ), double rebated, set into an 84mm deep frame with 160mm sill. f) These 3000mm Oak French Doors with sidelights open out as standard with the right hand door to open first when viewed from outside. g) Glazed with Toughened Low E Argon filled glass units with warm edge spacer technology for superior thermal performance. Whole Product U value of 1.5W/m2K. h) 10 year guarantee against manufacturing defects. 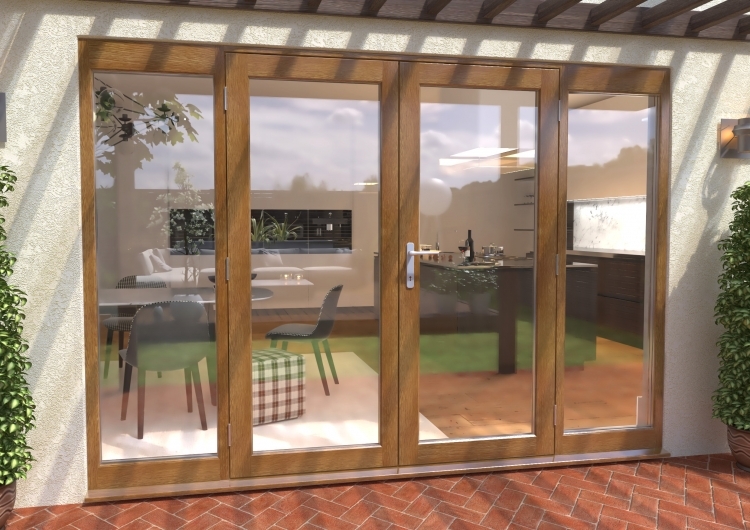 These doors are manufactured in one of Europes leading exterior Joinery factories and are manufactured to Scandinavian specifications known to be higher than UK standards. PLEASE NOTE THAT DUE TO CURRENT HIGH ORDER INTAKES THAT THIS ITEM IS ON A 4-6 WEEK LEAD TIME.